The presented map is the last work of the leading graphic Antoni Chodorowski. Like a colourful arras, it shows the cultural wealth of our nation. 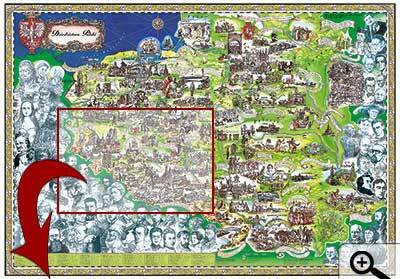 Motto of this map are the words of John Paul II: "Stay faithful to this heritage, the name of which is Poland..."
The artist with a pen and a paintbrush, joined the historical and literary characters . He highlighted everything that accounts for the Polish heritage. Along the frame of the map he placed portraits of famous Poles, who influenced the history of their fatherland in the outstanding way. The chosen quotations from distinguished national heroes, perfectly add diversity to the painted episodes of our history. The magnifying glass that is provided (in the folded version) allows one to discover beauty of details presented on the map.